Settle in Bulldog fans, it's going to be a long ride. Georgia picked up where it left off last season. The only positive change I detected yesterday from a year ago was that we did tackle better. We continue to have a passive defensive philosophy, we still cannot cover a kickoff, and offensively we remain very vanilla. If you are an avid Dawg fan, it really isn't that hard to call plays right along with Mike Bobo. Sadly, he's that predictable. After one game, I know less about quarterback Joe Cox than I did before the game. Was he playing with the ill effects of medication and flu-like symptoms? Was he just not very sharp, like having an 'off' day? Can he play better? Will he play better? Consistently? Plus, I don't think very many teams would trade tailbacks with us. Our experienced offensive line looked anything but that. They failed to control a defensive front they should have dominated. Probably the second weakest they will see this entire season. Chew on that for awhile as the SEC teams come rolling in. 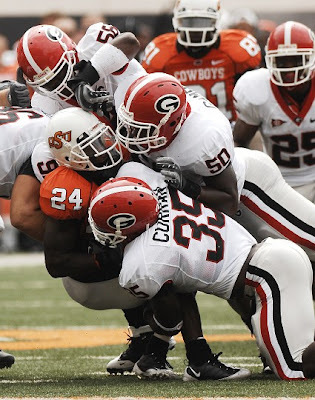 Speaking of weak defensive lines, Georgia left Stillwater with no sacks, and no turnovers. Doesn't that sound suspiciously familiar? We again failed to win the oh-so-important turnover ratio: OSU - 3, UGA - 0. Our defensive backs still seem to be too intent with talking 'smack', rather than playing football. To wrap it up for me, Georgia seems to play like a team trying not to lose, as opposed to a team trying to win. There is a huge, huge difference in the two. We don't GATA, on either side of the ball. That comes down to philosophy, to coaching. Two more questions for you: 1)Can we improve, and 2) Will we improve? I realize it is early, but once these Saturdays arrive, they seem to fly by quickly. And we're starting out 0-1.